SPONSORED STORY - Shopping has now been made healthier, simpler and more environmentally friendly thanks to a unique shopping trolley that is taking Australian shoppers by storm. With its refined design that has been worked on for over 7 years, the Australian invented CarryMaster offers shoppers much more than ease of transport, it offers a range of health benefits too. Gary Kagan from CarryMaster says that more Australians are becoming aware of the health and safety concerns of using public shopping trolleys and says that CarryMaster is the solution many are seeking. “We are living in a society that is increasingly becoming very health and safety conscious,” he says. “It is a fact that when using supermarket trolleys you are exposed to anyone carrying a virus – whether that be a cold, flu or even gastro – and this can be passed on to the next user through the trolley. “The potential spread of viruses and other germs through trolleys was a topic covered by American talk show The Doctors on ABC and is a concern that many Australians have as well – and for good reason. “Not only is there the risk of spreading and contracting viruses, there is the question of what else has made contact with the trolley through the feet of toddlers and children through sitting or standing in a trolley. “It’s unhygienic for the next customer who fills up their trolley with food and is unaware of what their shopping has been exposed to. 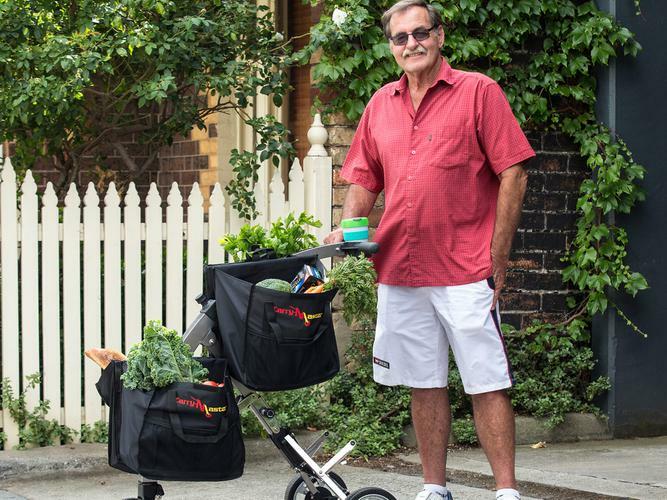 Offering a germ-free and environmentally friendly personal shopping trolley option to shoppers, Mr Kagan says it’s no surprise that it has been a hit with Australians of all ages. “The CarryMaster is your own personal shopping trolley which is germ-free and environmentally friendly,” he says. “It has four strong reusable, washable bags that will greatly assist in minimising the use of plastic bags – and you can buy more if you need. “We have all seen the consequences of using plastic bags – lying in rivers, on beaches, car parks and other public areas – and the Government is starting to roll out the banning of the plastic bag because of this. As well as being healthy and environmentally friendly, Mr Kagan says that the CarryMaster is also highly convenient for transporting shopping – especially for those not relying on a car, like the elderly. “The CarryMaster is great – so convenient,” he says. “There is no more returning a trolley to the designated area, no more multiple trips from the car to the kitchen or worrying about walking home too many bags of shopping. “It’s a great asset to have and means that more often, Australian shoppers can get out and about and walk to and from the shops with ease. “The CarryMaster is incredibly easy to manoeuvre and glides effortlessly and it’s compact enough to fit in apartment lifts and can collapse to a size that is easy to store. “For those looking to use it with a car – it can also easily fit into the boot. “The best part is that unlike traditional shopping jeeps, the CarryMaster lets you spread your groceries across four bags so nothing will get squashed – it’s every shoppers dream. “The design even features a ledge on the back to allow you to carry a large item like a carton of drinks which is supported by the CarryMaster’s robust frame. Visit the CarryMaster website for more information and to order.